The Regulatory Authority for Energy (RAE) granted an Production License from an offshore wind farm of a total capacity of 498.15 MW, consisted of 81 offshore wind turbines (WTG) with 6.15 MW capacity each, located in the area northeast of the island of Lemnos, to City Electric S.A., a 100% subsidiary company of holding company R.F. Energy S.A., which shareholders are the listed on ASE company F.G. Europe S.A., owned by G. Fidakis, mr. G. Fidakis and the Restis Family. This is the first offshore wind farm in Greece and the third largest in the world. The investment, totaling € 2 bil., has been designed by qualified and well trained staff of R.F. Energy S.A. operating since 2006 in the field of Renewable Energy Sources, having a portfolio of projects in operation with power of 62 MW, with production licenses of total power of 792MW and projects under licensing procedure of total power of 95.5 MW. This portfolio consists mainly of wind farms, biogas plants and hydroelectric stations. The implementation of the investment will bring economic growth and visibility in the northern part of Aegean Sea and the island of Lemnos. 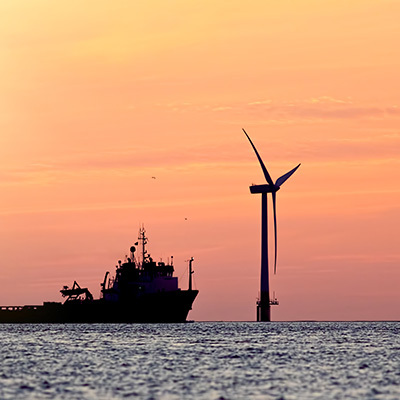 The offshore wind farm, in conjunction with its interconnection to the National Grid in the northern Greece, becomes a project of national importance, since it contributes significantly to the achievement of national targets for RES till 2020 (20-20-20). After completion, the offshore wind farm will produce “green energy” (1,692.3 GWh on an annual basis), sufficient to power about 500,000 households, i.e as a city with the size of Thessaloniki, while its operation will contribute to reduce CO2 emissions by 1,730,976 tons annually. All WTG’s of the offshore wind farm have been sited outside Natura 2000, areas with ecological priority, outside the boundaries of archaeological sites and at a great distance from the coast so as to reduce the visual impact to a minimum. The existing transmission grid will be upgraded and will give the opportunity for the island of Lemnos to attract investments of economic and technological nature, adding to the island, beyond the dimension of a tourism destination, that of a “green” energy destination, since there will be parallel investments in the field of Renewably Energy. The company’s financial strength and its high credit rating are assigned to its shareholders; the listed on ASE company F.G. Europe S.A., owned by G. Fidakis, mr. G. Fidakis and the Restis Family, who believe in their abilities and undertake the implementation of large – scale investments.